I was expecting a laugh at best, a pummeling at worst. And in case you are wondering whatever happened to Ivan “I Will Break You” Drago, you’ll be happy to know that he recently directed and starred in a movie with Jerry Springer as his co-star. The latin leg-press chick was hairless? Wow DCB, I am impressed. The thought of you working out makes me want to squeamish. But anyways come to my site people because the weekend is coming and we got the up and coming SWAMI PICKS!!!! That should be a delight! Oh no j00 di’int! You better watch it, cholo! I love it when you draw. So their legs were tight… but what about the tummies? Why is everything compared to this dolph character. I think i may consider renting rocky so I can see. You can only lift 5 lbs? Sad. My grannie can lift more than that. Were they doing a lot of grunting? I *LOVE* it when they grunt. Just to complete my mental image, butch or femme? I think I would have been a little too intimidated to say anything to those women! I don’t think women should be too muscular (or thin for that matter). Women should be soft. You can be healthy and toned and still be feminine and curvy. I wonder do women like that attract men…if so, what kind. I agree with Kathryn. The drawings are great. insomnia: rocky IV is my favorite childhood movie. One of them was butch, and one was femme. Ironically, the dolph lookalike is what I would consider femme. They did not grunt.. i wish they did because we know what they would sound like. Ah. I do so love your artistic works :-)!!! I’ll do you one better, dcb. Dolph is currently living in , and is into karate. A friend of mine bumped into him there several months ago. Messed up on the hyperlink. Go to http://matt.makalumedia.com/archives/000520.html. BEST CARTOON EVER IN TIME. Jessa, the only good cartoon is the caricature of your feelings towards DCB and repressed ones for me. DCB, if Rocky IV was your favorite childhood movie, shouldn’t the correct line be “I must break you.” His other main line was “You will lose.” Now some would say that no one should know specifics like this, but he only said five lines the whole movie, maybe six. I’m disappointed. “I must break you” sounds a lot more sinister. Captain is correct. 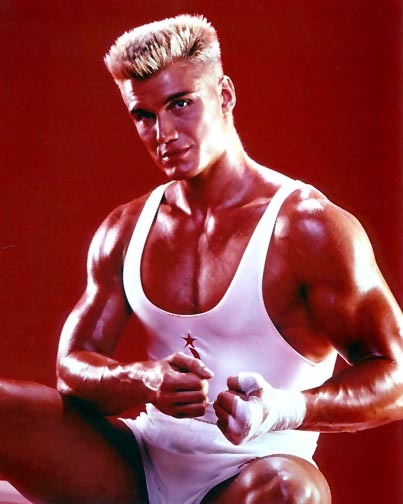 Another popular Drago-ism is “if he dies…he dies”.